Ready made pizza, frozen or chilled, just doesn’t cut it for me. Overpriced, bland, full of salt, and no fun to eat the next day. I’ve spent a lot of time in the last few years trying to create a home recipe that’s reliable, yet without compromising too much on taste. And my friends and family have been rather patient throughout. The ingredients aren’t the problem here. Any supermarket will stock exactly what you need. So what are the difficulties? There’s one major factor. Home ovens just don’t go high enough for traditional recipes. 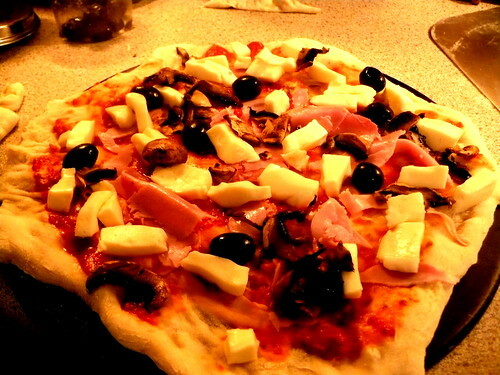 The typical Naples style pizza, now protected by law, is pretty much impossible to replicate unless you have an oven capable of reaching at least 400°C. I’ve tried using the super fine ’00’ grade flour in dough, and met with miserable results. The deep dish style popularised by Pizza Hut is essentially fried in an oiled dish; largely based on the Chicago style. A lot of chains (Dominos, Papa Johns… I’m looking at you) have a conveyor belt with a heating element above and below. Again, it’s doubtful you’ll have that to hand. 2. Cooked at as a high temperature as the oven will allow. The base will crisp up while staying soft inside, and cheese will practically liquify and bubble, as opposed to just drying out. 3. A good dough. Should be nice enough to eat on its own. Here’s my pretty reliable dough recipe. Makes enough for 4 large bases. It’s a pretty basic recipe. If you’ve got the proportions right, it’ll come together rather quickly. 7 or 8 minutes maximum of kneading is perfect. 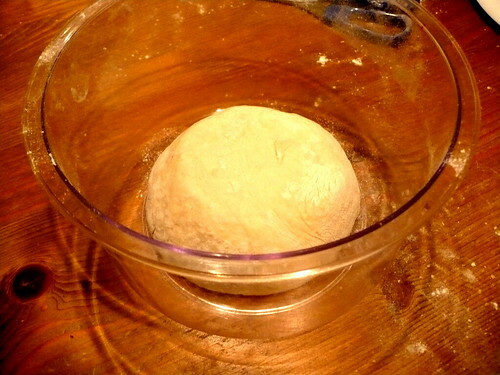 Put the dough in a container, cover the top with a lid, or clingfilm. Again, pretty standard. Here’s where I step away from the typical cookbook recipe. 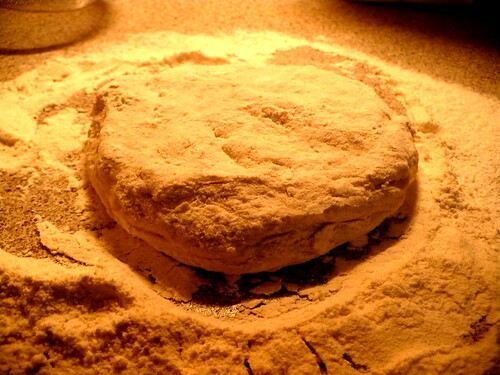 Many suggest an hour or so of leaving the dough to rise “…until it has doubled in size”. You can pretty much recite it, can’t you? We should be little more ambitious. I put this container in the fridge for a full 24 hours. It’s pretty much the norm for any restaurant making its own dough to make it at least a couple of days in advance. Typically spending much of its time chilled. A better flavour develops, and more bubbles form. Every stage from now on is improved. It’ll be easier to shape the bases, develop better in the oven, and far nicer and lighter in taste. As you can see, I heaped the work surface with flour, split the dough into two balls, and got to work. Make sure the dough is coated with flour before you start to shape it. Oh, and if you’re thinking of using a rolling pin… best avoided. It’ll knock out all the air from the dough, and you’ll still end up stretching it out of shape when you try to pick it up. The dough should be so light and malleable by now that it’s easy to form the bases entirely by hand. Again, it’s a quick process. This is where convenience should take priority. I do have a pizza stone; well seasoned and blackened from years of sitting in the oven. But to be honest, it’s utterly impractical for fresh pizza, unless you’ve got a massive shovel to scoop up the freshly prepared pizza and flick it into the oven. A good old metal tray will serve you well. It has the benefit of letting you transfer the base immediately, and leaving it to rise for half an hour or so. 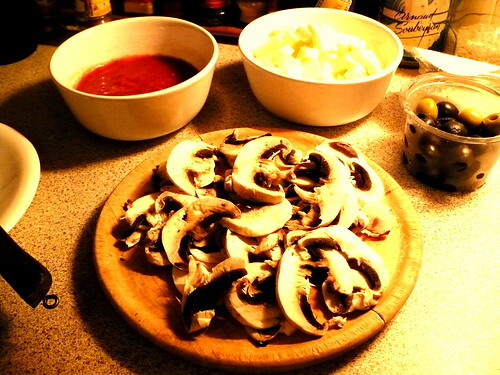 You can even prepare a pizza or two in advance. I’m all for inventive toppings (I don’t have a problem with anyone who makes the case for pineapple…) but the best results are always when just a few select ingredients are used. You really don’t want to overload your pizza. The most authentic sauce is solely pure, fresh tomatoes. Sadly, we can’t rely this all year round. It’s also rather perverse to ship your tomatoes from Italy, isn’t it? I’d use a decent quality tin of tomatoes from any supermarket, and crush them with a clove of garlic, dried oregano and a little salt. 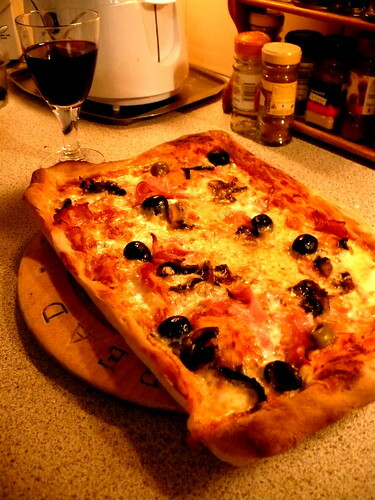 Opted for a few olives, grilled some mushrooms while the oven was heating up, and some nice smoked ham. Mozzarella’s all but essential with pizza. The best possible kind you can use in a home oven are the shrinkwrapped blocks of the fresh stuff. Decent flavour (miles ahead of the grated variety), with some of the water taken out. I love the fresh bags of mozzarella, particularly the buffalo milk kind. But they can really swamp a pizza in a home oven. Bit of waste to cook them, too. Most home ovens go to 250°C. This is adequate, but it’s essential to have it fully preheated. I tend to put the pizza on the top rack, nearest to the heating element, but a little trial and error is needed. Those first few seconds in the oven are crucial. 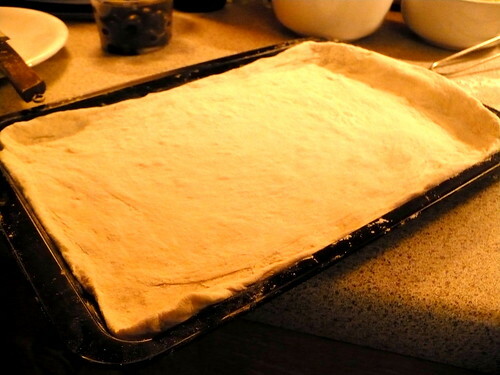 The initial ‘hit’ causes the dough to puff up and ensures a light base. You wouldn’t open the oven door to check on a cake until the very end because it would collapse.. The same principle applies here. A stone is brilliant for cooking pizza on. It conducts heat amazingly well, providing the kick that gives the pizza its shape. It also absorbs moisture, resulting in a crisper, more textured base. 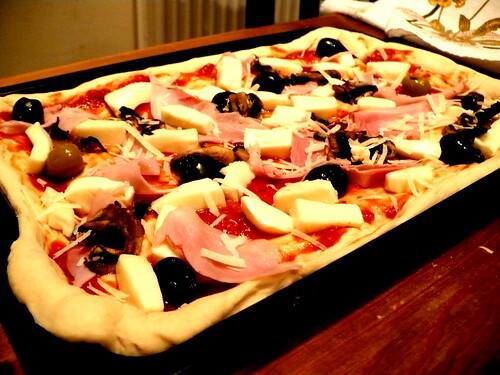 However, I’d much rather settle for convenience and consistency, especially if making more than one pizza in one go. Much easier to have a few trays around. This looks absolutely incredible. So jealous of you living with your parents and having nice ingredients at your disposal! Found this whole pizz-a writing to be both well researched and accessible. Mike, your enthusiasm for well made home cooked food is highly infectious. I am really looking forward to trying this out. Great pics too. Broadcast journalist, based in Cardiff.